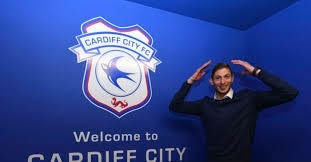 February 4 – Air accident investigators have discovered the wreckage of the light aircraft carrying Argentine-born Emiliano Sala and his pilot which disappeared over the English Channel last month en route to Cardiff where Sala was due to make his debut for the Premier league club. With the official investigation called off, a privately funded underwater search had begun on Sunday, several days after two seat cushions were washed up on the French coast that likely belonged to the aircraft. The marine scientist directing the search said the plane taking Sala from his previous club Nantes to Cardiff on January 21 had now been located. David Mearns, an American-born shipwreck-hunting specialist, made the announcement on Twitter after returning to the island of Guernsey from the search and police informed the families of the two missing men. Cardiff signed the 28-year-old Sala for a club-record fee, reported to be £15 million, on January 19. The striker left Cardiff after signing his deal and returned to Nantes to collect his belongings and say goodbye to teammates and staff of the French club. He never made it back to Cardiff and at the club’s first home game since the plane disappeared, Cardiff paid tribute to Sala before a 2-0 victory over Bournemouth with a series of touching personal tributes.